There are few things the Rayglass Legend 2800 can’t do. 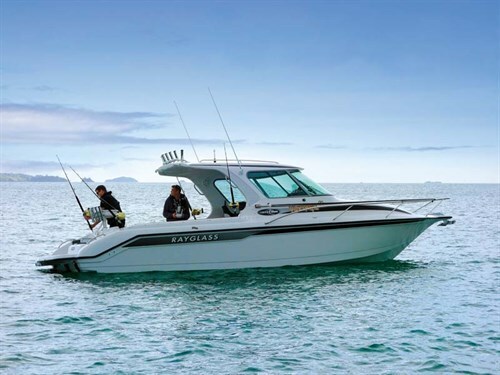 Rayglass Boats boasts more than 30 years of successful New Zealand boat manufacturing, and more than 50 ‘Best of Show’ awards, so you could say the company is coping nicely with the growing demand for quality, purpose-built Legend-badged boats. The local market is strong, and bolstered hugely by demand from offshore, particularly for its Protector range. Big international users such as US Coast Guard, European police forces, and various military branches have Protectors working on the water. Sporting organisations also have a long history of association with Rayglass, including the America’s Cup and Louis Vuitton Trophy as on-the-water umpiring vessels, so it is hardly surprising that Rayglass stands proudly at the forefront of boating in NZ and the world today. Winners of the Ernst & Young’s Entrepreneur of the Year in 2001, this enterprising and capable company could have easily disappeared into a fog of self-congraulation, but nothing could be further from the truth. The new premises on the water at Mt Wellington, Auckland, is welcoming and reflects the excellence in every aspect of Rayglass manufacturing – you could eat lunch off those gleaming polished floors, and the ubiquitous sparkling finish is maintained everywhere. When Ian Sullivan and Scott Little, marketing manager and sales director respectively, emerge from within, they are simply beaming and just a bit too damn happy-looking for my money. As I learn more it’s easy to understand why – in the game of boat marketing they’ve just won the lottery and are keen to show off their biggest trailerboat beauty, the Rayglass Legend 2800 diesel sterndrive. This year, the big 2800 not only won the ‘GRP Fishing Boat Open’ at the Hutchwilco New Zealand Boat Show (a tough crowd to win accolades in), but the 2800 went on to take out the biggest prize, too – the coveted ‘Boat of the Show’. At 8.7m long, this is about as big as a boat can be while remaining legally transportable on the road. Yet, that maximum trailerable width of 2.5m cannot be avoided, so the 2800 is built to micrometer accuracy within these parameters, while still maintaining its delicious lines overall. Sitting on the trailer in the showroom the Legend 2800 is an impressive beast, if a little daunting, dominating the view like nothing else. Aboard in the showroom I have a good clamber around, opening this and that, checking out the head and galley areas for working space and headroom. It is great to be able to get this out of the way while not bouncing about in some seaway, and ergonomically everything falls well to hand and the elbow room is both impressive and friendly. Although this Rayglass 2800 is configured primarily as a big weekender, she is also a seriously capable fishing platform. 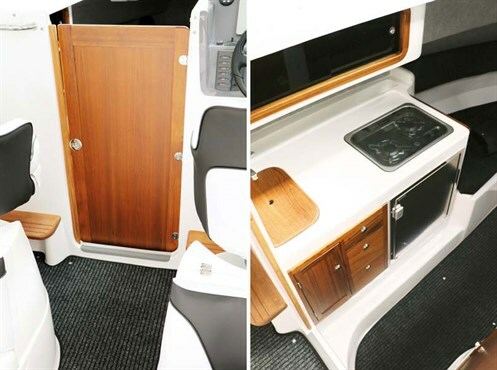 There is storage galore; under seats, under bunks, in the transom and underfloor. Rodholders in the side walls of the gunwales allow for safe stowage of good quality rods and reels away from weather and salt spray. The cockpit is damn near as big as your average dancefloor and self-draining, also featuring great fishing stations on the outer boarding platform where an Icey-Tek bin can be housed on the rear engine coaming. A baitboard can also be mounted off the back of the duckboard for even more fishing space if required. In the transom is a livebait tank with lid and opposite, a basin and washdown tap sitting snugly inside a lidded compartment. 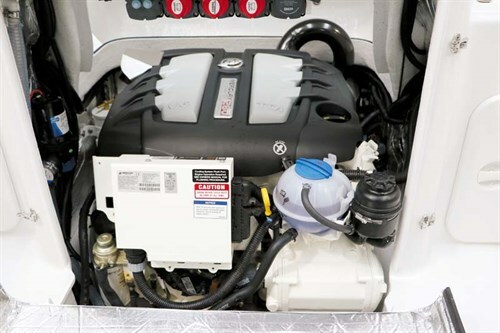 The battery switches are inside the engine box that ingeniously forms part of the transom moulding, with minimal intrusion into the cockpit. The engine hatch folds down and lies flat on the deck allowing access to fuel filters and engine maintenance. Clipped with four hinge cams it sits back snugly against the transom leaving the dancefloor unencumbered. Immediately ahead are two centrally positioned, hatched and generously rotomoulded plastic fishbins – great for salt ice and catch of the day storage. The aft-facing passenger seats lift on hydraulic rams, giving access to cavernous storage beneath. The two forward seats pivot 360-degrees and allow viewing to the rear for trolling while occupants remain comfortably seated. A fire extinguisher is mounted unobtrusively below the navigator’s seat within a recess in the seat-base moulding, flush and out of the way. The toughened glass windscreen offers excellent vision and two wipers keep the view pristine up front. 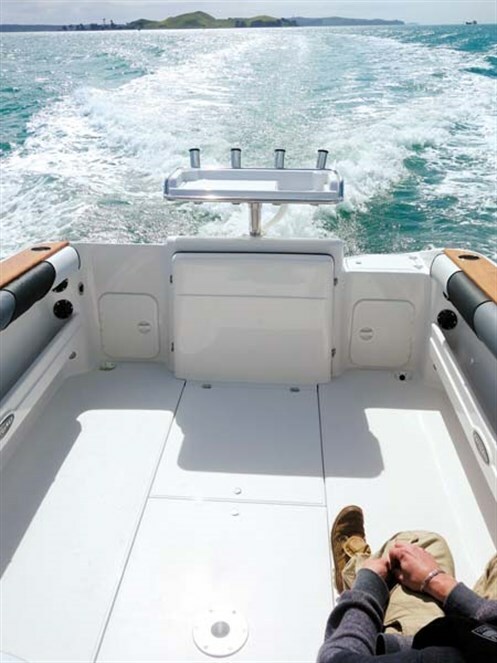 Sliding side windows allow both air flow and communication forward to the foredeck. Above the helm, the radio and stereo are mounted in a teak strip fixed to the white gleaming hardtop, out of the way but easily to hand. The helm station is comfortable and access to instruments is simple, uncluttered and instinctively placed. 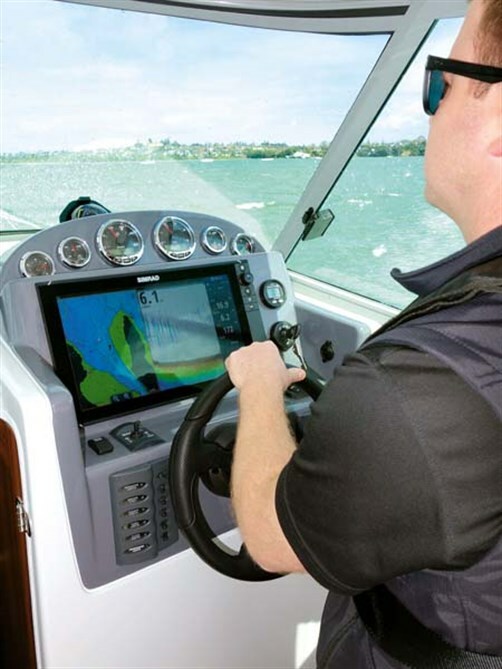 The helm has the usual sports wheel, light to command and accurate, and for instrumentation, the terrific Simrad 16in touchscreen does the business. I like this unit very much; it’s flat, flush, bright and simple to use, while its split screen is easy to negotiate and configure. Engine information is provided by digital gauges and the layout is pleasing to the eye. Dash top storage is good and useable. The Maxwell winch hauls a generous rope and chain combo attached to the Sarca Excel anchor snugly homed between the double-roller bowsprit. Strapping stainless steel bow and grab rails are de rigeur, they look terrific and are sturdy to the grip. On the aft edge of the hardtop is a six-pot rocket launcher, with places for four more rods on the baitboard, in this instance mounted on the tall boarding platform rail. The weekender aspect of this boat is terrific, with human needs taken care of to a fine degree, including a hot and cold shower at the stern. The macerating electric toilet beneath and forward of the helm station is a very welcome addition, as is the manner in which the door swings into the main companionway and is held in place magnetically, assuring complete privacy below. The forward bunk is large and my 183cm frame fitted without a problem and with room to move about. The galley is fitted with a fridge that’s large for a boat, an excellent two-burner gas hob under a toughened glass top, a sink unit with tap, pressurised freshwater and wooden infill top to make this a great kitchen preparation area. Useful drawer and cupboard space beneath allows storage of all cookware and crockery, and above, at eye height, is a lined shelving unit with double opening sliding doors for pantry and mug storage. The layout works well, allowing for fresh coffee and hot food to be delivered during the journey, or at rest in some gorgeous fishy bay. 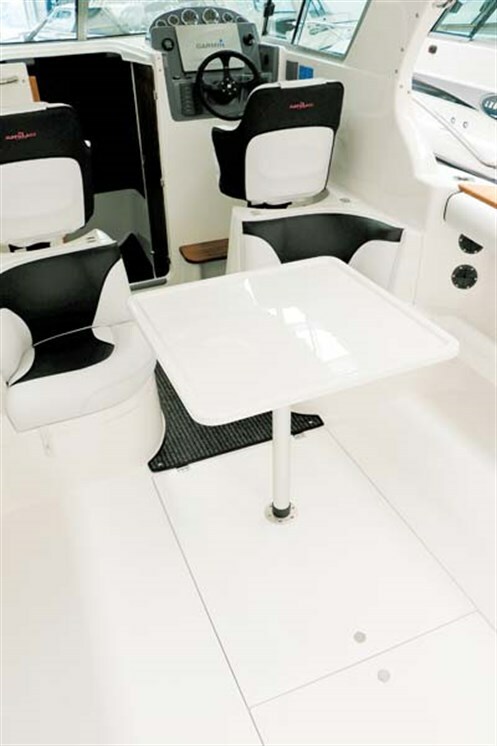 At day’s end the table can be placed in the socket in the cockpit floor for dining or drinks, and with the Cruiser hardtop, as fitted to the test boat, the cockpit holds weather well at bay and delivers sun protection par excellence. Were you configured a vessel more for fishing, the standard hardtop might be preferable being a little shorter and less in the way for casting rods. For mum and dad, this is a launch-capable home-away-from-home with the looks and performance of a high end sportsboat that you can hook to the 4WD and take with you wherever your fancy takes you. This fusion of applications works in the 2800 like few others, and there is little this boat couldn’t tackle. Rigged for gamefishing it would be no disgrace outside the BOI Swordfish Club or at Three Kings. Trolling on Taupo, it could handle whatever mad mountain weather was thrown at you. The Manukau and Raglan Bars will hold fewer fears, while tootling round Coromandel, over to Great Barrier Island, Cuvier and beyond are all within its reach and ability. Scott Little tells us there’s a magic mix in these beautiful Rayglass 3.0lt Mercury Diesel Bravo Three combos. He calls it "The three-three-three." "Cruising," says Little, "uses about one litre per nautical mile, and three-three-three refers to 3000rpm, 30mph, at 30lt/h." Let’s do the maths. With 300lt aboard that’s 10 hours-plus steaming – a good range, but the boat can be optioned with a 400lt tank if desired. 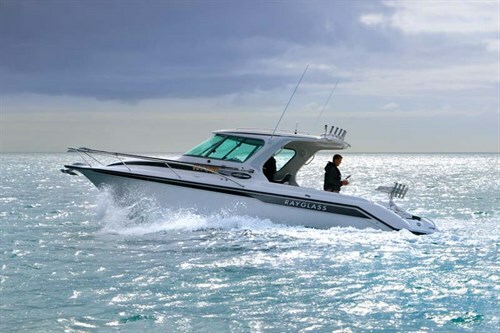 Given the ease of obtaining diesel on the water around the NZ coastline, this would really open up some fantastic cruising and fishing aboard this comfortable, sporty girl. And it is out on the bigger water that this boat really hits her straps. The big deep-vee and long waterline length combine to smooth out the roughest patches that 27kts of cold-wind-against-tide can produce. Your crew will welcome the ease with which they slip past others beating their way home in the late afternoon, too. At 28ft we’re into bigger boat territory, but without the usual associated slowing of response to helm and throttle. Instead, the Legend 2800 responds to direction changes like a sportsboat, snappling into turns and tracking accurately, while the digital throttle delivers a good handful of power and responds with a satisfying leap when nudged. Shoved to the max there is a microsecond delay as the throaty TDi powerplant checks you really want that much throttle, before leaning into its work like an Olympic rower. The counter-rotating Mercury duoprop is revelatory. Turns can be held through the tightest angles without breakout, and even in reverse I managed to swing her about from side to side with alacrity. Returning to the boat ramp with a strong flood running, we nosed in and the stern got pushed past the head, but a quick flick of the throttle and helm had her tight against the wharf in seconds. Manoeuvrability of this order is invaluable and owners will have their adrenalin fatigue symptoms considerably reduced when docking. Rising above all of this is the sheer lustrous aura of a stonkingly well-built, perfectly finished, gleaming modern vessel that’ll knock the socks off all who see it, and for years to come. If you can afford this boat … do so. You are going to feel like royalty at your own maritime garden party. *Sea-trial data supplied by the manufacturer. See the full version of this review in Trade-A-Boat #259, October / November 2015. Why not subscribe today? Keep up to date with news from Trade-A-boat or like us on Facebook! Matt Jones gets up close and personal with the Rayglass Legend 2500.